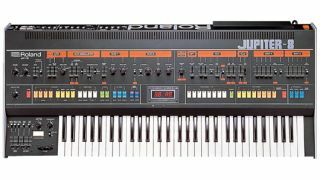 The Jupiter-8 will be one of the stars of Roland's show. If, like so many of us, you've got a soft spot for Roland's classic synth gear, you may be interested in attending one of the Roland Synth Story events that will be taking place across the UK in November. Featuring a panel that includes Richard Barbieri (Porcupine Tree and Japan), Graham Massey (808 State) and Jody Wisternoff (Way Out West), this touring roadshow will give you the chance to hear these artists talking about their experiences and love of Roland synths. Those who attend will also get a chance to get their hands on some classic Roland gear. The Jupiter-8, Juno-60, Jupiter-6, Jupiter-4, Juno-106, JX-8P, D-50, JD-800, JV-1080, JP-8000 and XV-5080 are all set to appear. You can book your place now on the Roland UK website. Alternatively, if you can't make any of the dates why not take a virtual trip down memory lane with our Roland Synth Chronicle. Roland has come a long way since its inception in 1972. Its synths, drum machines and effects have been used on some of the most famous records ever and have helped artists push sonic boundaries, creating new sounds and even radical new musical genres. Taking part over three dates in November, the Roland Synth Story tour will explore this rich history through a roster of artists and experts. It's an exciting opportunity for visitors to learn more about Roland synths, speak to three musical icons and even get their hands on some classic Roland vintage gear. The panel of experts, including Richard Barbieri (Porcupine Tree and Japan), Graham Massey (808 State) and Jody Wisternoff (Way Out West) will all talk about their experiences creating electronic music as well as discussing their favourite Roland synths. They'll also be on hand to answer questions and chat to visitors after the event. All three guests are intrinsically linked to the history of the synthesizer. Richard Barbieri's first ever synth was the Roland System 700, and he's never looked back. His band, Japan, notched up numerous hits in the '80s and they became a cornerstone of the influential synth-pop movement. Graham Massey infamously named his band '808 State' after the famous Roland TR-808 drum machine, which - along with the TB-303 - was an essential component to the way the band produced their music. Jody Wisternoff uses a stable of Roland synths, including the Juno-106 and the legendary Jupiter-8, to make progressive house and breaks as one half of Way Out West. Their music didn't just hit the charts, it also found its way into TV shows and video games.